Chambliss, Bahner & Stophel, P.C. 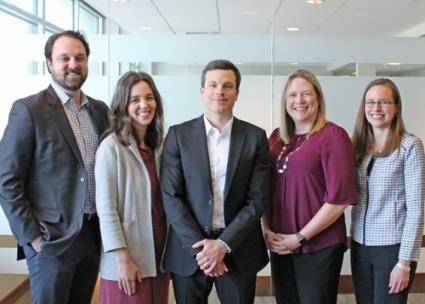 announces that Catherine Dorvil, Christopher Hennen, Willa Kalaidjian, Andrew Leffler and Laura McKinney have become shareholders at the firm. "The new class of shareholders is the largest group of attorneys the law firm has promoted in the past decade, and reflects Chambliss' focused development of its next generation of diverse leaders," officials said. Their respective practice areas cover litigation, health care, mergers and acquisitions, real estate and corporate governance and commercial transactions. "Cathy, Chris, Willa, Andy and Laura have significantly contributed to the growth and success of our firm. They are an integral part of our team, each with a unique and effective skill set, and deliver excellent results for our clients. They join our next generation of firm leaders who are dedicated to making a positive impact on our client service in this evolving business environment and competitive legal marketplace," said Mike St. Charles, the firm’s managing shareholder. Ms. Dorvil, a member of the firm's litigation and health care sections, has extensive experience representing clients before administrative, state and federal courts. She regularly works to resolve disputes and address regulatory matters for a wide range of health care entities, educational institutions and nonprofits. Prior to joining Chambliss, Ms. Dorvil worked as a commercial litigator for the national firm of Hogan Lovells US LLP in Miami, where she was honored with the 40 Under 40 Outstanding Lawyers of Miami-Dade County Award. She serves on the board of directors for the Urban League of Greater Chattanooga, the Chambliss Center for Children and the Children's Nutrition Program of Haiti, and is active with the Chattanooga Women's Leadership Institute and American Inns of Court. Serving in the firm's business and mergers and acquisitions sections, Mr. Hennen focuses his practice in the areas of general corporate matters, asset and stock purchase transactions, preparation and negotiation of commercial contracts, entity formation and structure, corporate governance and similar corporate matters and business transactions. His industry experience includes work with clients in the food and beverage, manufacturing, automotive, chemical, software and sports and entertainment industries. He has served the community in various capacities, including as a board member for the local Susan G. Komen organization, as a member of the board for the Chattanooga Chamber of Commerce's Downtown Council for five years and as a co-founder and current active member of The Rotaract Club of Chattanooga. As a founding member of Chambliss Startup Group, he and Ms. Kalaidjian, also a founding member, collaborated with some of Chattanooga's top entrepreneurial influencers and assisted a wide array of startup companies and at startup events and competitions to build and support the City's innovation community. Ms. Kalaidjian chairs the Chambliss Startup Group and is a member of the firm's business and real estate sections. Entrepreneurs, emerging growth companies and investors turn to her for counsel on entity choice and incorporation, intellectual property and technology rights and investment and commercial transactions. In addition, she advises some of Chambliss' top clients on commercial and business transactions, environmental matters, telecommunications and energy law and real estate. Ms. Kalaidjian regularly speaks and mentors at The Company Lab, a predominant Chattanooga-based startup incubator, and is a member of the Tennessee Bar Association Environmental Law Section Executive Council, serving as chair of the section in 2016. An integral member of Chambliss' real estate section, Mr. Leffler advises regional and national clients on all sides of the deal from contract to closing, whether seller, buyer, lender, landlord, tenant or investor. He also assists with issues and disputes that arise after the closing, including easement and reciprocal rights agreements, owners association issues and financial workouts. Prior to joining Chambliss, he practiced law at a boutique real estate firm in New York City for seven years. Mr. Leffler serves on the board for the North Chickamauga Creek Conservancy and has participated in the tnAchieves program. Ms. McKinney has over a decade of domestic and international transactional experience and practices in the firm's business and mergers and acquisitions sections. She advises clients on general corporate matters, asset and stock purchase transactions, preparation and negotiation of commercial contracts, entity formation, corporate governance, regulatory matters and family business succession planning. She has experience advising clients in the manufacturing, energy, beverage, logistics, chemical and mining sectors. Before joining Chambliss, she practiced law at the international firm of Debevoise & Plimpton LLP in New York, advising clients on complex cross-border transactions and joint ventures. Ms. McKinney is an active member of the Chattanooga Women's Leadership institute.